RIGHT REVEREND MONSIGNOR EDWARD J. HIGGINS, L.L.D . In early 1935 – Msgr. 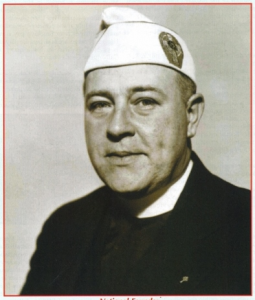 (then Father) Edward J. Higgins, with permission of his Bishop Ordinary, Most Reverend Thomas E. Molloy of the Diocese of Brooklyn, gathered together a few parishoners from his parish, Church of the Immaculate Conception in New York, who had served in World War I, and organized the first Post of the Catholic War Veterans, A storia Post #1, which is a Post of Queens Chapter, Department of New York. May 19, 1935 – Catholic War Veterans of the United States of America was incorporated under the l aws of the State of New York. May 1935 – Father Higgins journeyed to Rome. Pope Pius XI bestowed his blessing upon the Catholic War Veterans, and blessed the American and Papal flags of the CWV. July 1940 – The Catholic War Veterans was officially recognized as a Veterans Organization by the Veterans Administration in Washington, D.C.
August 17, 1984 – President Ronald Reagan signs legislation granting the Catholic War Veterans (CWV) a Congressional Charter, being the 59th group to receive a Federal Charter, expressing deep admiration for our commitment to serve both God and Country. Click HERE to read our Charter. Ever since the close of World War I, America had been threatened by the so-called political heresies commonly known today as the “Ism” movement, their purpose to destroy Christianity. Incidentally, up until this time the Catholic Church in America had, strictly speaking, no militant veterans organization made up of men and women who had served their country in time of war. It is true that the Knights of Columbus saw to the needs of Catholic soldiers in camps and behind the battlefield. However, the Knights of Columbus is not a veterans’ organization, but rather a lay organization, commissioned by the United States Government to render services to Catholics in the Armed Forces of the United States of America. Our Holy Father, Pius XI, warned the world of the dreadful disaster and danger of the “Ism” movements. In response to this warning, aimed directly at Communism, the Reverend Edward J. Higgins, Pastor of the Church of the Immaculate Conception in Astoria, Long Island, New York, determined not only to heed the Pope’s plea, but also to do something about it. Father Higgins, who had served as a commissioned Lieutenant Chaplain in the United States Army, had discovered that Catholic servicemen and women had very little organized voice in national matters that concerned their God, their Country and their Home. He knew that without some sort of organized action, the Catholic Veterans could not, as a specific group, voice their approval or disapproval on any matters of grave importance. Thus, Father Higgins conceived the vital need for an organized Catholic veterans’ group. It was due to his priestly guidance, together with the worthy efforts of Past National Commander, John M. Dealy, that the Catholic War Veterans’ of the United States was incorporated under the laws of the State of New York on May 19, 1935. In May 1935, Father Higgins journeyed to Rome and while there had a private audience with Pope Pius XI. Father Higgins informed his Holiness of what he had thus far accomplished in organizing and establishing the new veterans’ group. He elaborated, too, on his plans and hopes for the future of this organization. Pope Pius XI was pleased with and intensely interested in this new drive for Catholic Action. The Holy Father did not fear for the future of the organization, but, mindful of the Lord’s own words..
“Where there are two or three gathered together in my name, there am I in the midst of them”. …bestowed upon it his blessing. On this same occasion, the sovereign Pontiff not only blessed the American and Papal Flags of the new organization, but presented Father Higgins with a photograph of himself specially autographed, as an inspiration to urge members ever onward in their endeavors to make this land of ours safe for democracy.